With Don gone for most of our dinners per week now (he just switched to swing shift for the year) I have no one to be referee between me and the kids for dinner hour... and therefore I have to plan, or we just may end up eating crackers and cheese at every meal. I have decided to join in Menu Monday. 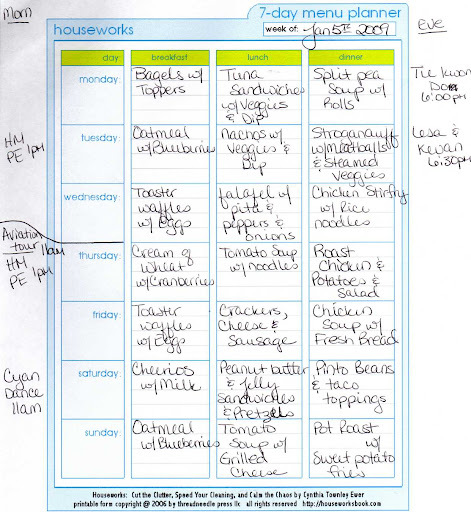 My friend Katie does this and I think it is a great idea as it gives me a deadline to have all my meals planned for the week... which means shopping is more streamlined and everything flows smoothly. This is week three. I have started to add important dates on the menu so that Don knows the parts of our calendar he may have to be involved in. That has worked out well too. I have started keeping a whole household notebook. And let me tell you, in these days of Tae Kwan Do one day, Jazz/Tap the next day, homeschool PE and swimming in the middle, along with everything else? It has made a HUGE difference in how our household runs. We all have chores, and they are all in the household notebook. Even Don has things he needs to do each weekend and I put them in the notebook, and then on the fridge so he can have a quick reference to what is required that week. Haircuts, car repairs, things I need his help with... they all go on there. Then, instead of us rushing 5 different directions each week, he asks me if I have done such and such, and if not, it still gets done. How nice is that? It has only been since Dec 24th that I have been doing this... so I am still very much perfecting my technique... but if I continue to do it this way, I will start documenting so others can see it. It has been wonderful so far and I would love to share that if it works in the long run. Ahhh, nuts! ...Yesterday I shoulda, woulda, coulda, but didn't! I'm coming to Tacoma for a 10am Dr. appt. this morning. I'll call you when I'm done, and stop by if you're home. I've gone back to menu planning this month too. We had gotten away from it for a few month when money was tight and I was basically using random stuff I found in the pantry, but I got tired of standing in the kitchen at 5 everynight lost on what to make. I am always alone at dinner, and it helps a lot!! Hope your day today was better than yesterday! just a little mama lurker who loves your blog thanking you...i really appreciate your posts, and totally like listening to your music choices.. thanks mucho! Thank you erika. That is very sweet! Katie, I got your email on the cleaning recipes. Thanks!